Templeton Aerodrome was built during the 2nd world war. Several farms were requisitioned and demolished to make way for it.The building of the aerodrome had a big impact on the village. After the recession of the 1930's it provided employment for local people and it created an influx of people from out of the area. RAF TEMPLETON opened in December 1942 under the command of No. 17 Coastal Command. 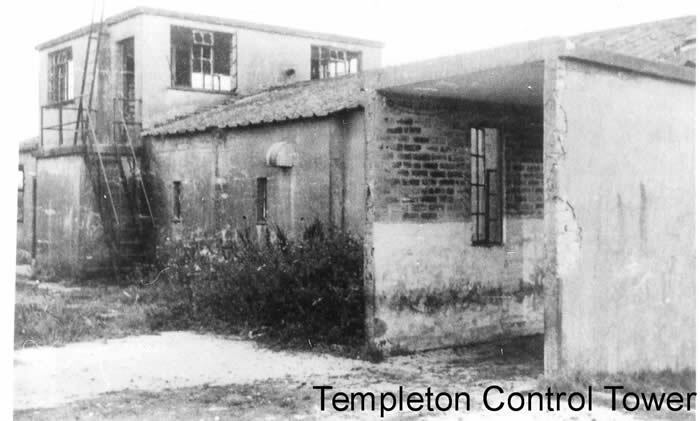 Templeton was to house all the RAF personnel from Haverfordwest & Templeton. January 1943 306 Ferry Training Unit was formed at Templeton to train crews to ferry new Bristol Beauforts to RAF stations across the world. They moved to Ireland in June 1943. June 1943 No 3 Coastal Command Training Unit moved into Haverfordwest to train crews for reconnaissance skills. The “O” Flight moved into Templeton with their Avro Ansons followed by No 7 OTU with Wellingtons, Whitleys and Lysanders. December 1943	8th USAAF moved into Templeton with 1st Gunnery & Tow Target Flight, V111 USAAF, from Warton with Westland Lysanders & Miles Martinet towing targets for the fighters at Atcham. They stayed until May 1944. May 1944 595 Squadron from Aberporth used the airfield for target towing Spitfires. They initially used a Martinet but it crashed and Spitfires were found to be more suitable. January 1945. No 8 OTU moved into Haverfordwest. “A” Flight was detached to Templeton with its Spitfires & Mosquitoes. They only stayed until March but a small engineering unit remained at Templeton to carry out aircraft repairs. They moved to Benson in June. July 1945 The RAF closed RAF Templeton although No 74 Gliding School Air Training Corp continued to use part of the airfield as they had done since 1944. The Royal Marines took over the camp in 1945 and it was used as a holding camp prior to de-mob for marines from all over the world. There is reference to the Royal Marines being at the airfield at an earlier period of the war, when fears of an enemy invasion on Tenby’s beaches were paramount. After the war the airfield was used for storage for a short while. It has been retained by the military for training purposes and used quite frequently during the summer months, otherwise it is used for grazing and wildlife now abounds.